Wilt Thou Unkind, Thus Leave Me? The bulk of this CD (that is, most of the songs by Dowland) was recorded in 1963; the remainder dates from 1969. In one form another, this material has not been absent from the catalogues very often or for very long, and it is good to see it offered to a new generation of listeners with the fanciful title of "Heavenly Love, Earthly Joy." "Semper Dowland, semper dolens," goes the old phrase – in essence, if you're looking for something to bring you down (but not too far) John Dowland (1563-1626) is your man. Many of his lute songs deal with love affairs gone or going wrong, much as today. However, as expressed by Peter Pears in the original booklet note (reprinted here), "Dowland deals in tears and sighs, but they are of cathartic beauty." He and the other composers on this CD lived during the Elizabethan era; Thomas Ford was the youngest of the four. 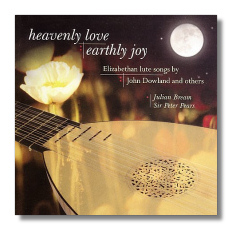 Bream, as famous for playing the guitar as the lute, also performs with refinement on this CD. Dowland was a lutenist himself (as was Philip Rosseter), and so the lute's role really transcends that of mere accompaniment in his lute songs. These are genuine duets. One senses that Bream and Pears worked very carefully to select the repertoire and to create precisely the effects that they were seeking. The results, while they might not satisfy every connoisseur of the Elizabethan lute song, are undeniably polished, and full of musical integrity.